Great story that builds on the Erdrick lineage. Three party members as opposed to DW1's one character. Turn-based battle system may turn some players away from this game. The true sequel to Dragon Warrior 1 adds two more playable characters, and 100 times more story and fun! This is the second game of the Dragon Warrior series, and the true "sequel" (since DW3 is a prequel to DW1). It's about 10 times bigger than Dragon Warrior 1. You start out as the Prince of Cannock castle. Just like in Dragon Warrior 1, you are a descendent of Erdrick, an almighty warrior. You hear about a man or creature named Hargon, who wants to take over the world. The King of Cannock castle sends you on very hard quest to find two other descendents of Erdrick, and rid the world of this thing called Hargon. The two others that you take along on your quest is the Prince of Mindenhall, and the Princess of Moonbrooke. The graphics aren't mind blowing, but they're really good for the NES. One thing people may not like is that there is no background in the battles (unlike Dragon Warrior 1, which had different backgrounds). It's just a black screen. The castles and towns are large... most of them larger than those of Dragon Warrior 1. The caves and towers look different, and on this Dragon Warrior, you don't have to use torches to see around in caves. The soundtrack is as fantastic as always. The overworld theme changes to a more joyous theme after you have the Princess of Moonbrooke on your party. This game is harder, and longer than the first Dragon Warrior. The main reason is that the enemy party can have up to about 7 different members, while you only have a party of 3. The bosses are really hard too, and it takes a long time to level up, so you might be fighting in one part of the overworld for a while, and getting gold to buy things takes an awfully long time like in DW1. Since you might be staying in the same place for a long time in order to gain levels and get gold points, it might get annoying, and you might not think that the game is fun anymore. If you can live with this, and you like how you must have lots of patience to master the Dragon Warrior games, then this game should be really fun and exciting. I personally enjoy this aspect of the early DW games. I've beat this title multiple times , and enjoyed it every time. Simply put, this game is great. I liked it a lot better than Dragon Warrior 4. 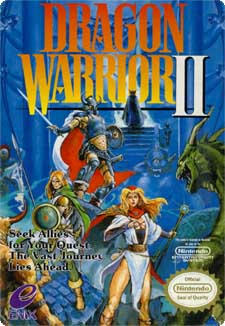 Although it might not be as long, Dragon Warrior 2 is still pretty long, and should take you about a month to beat it. If you liked Dragon Warrior 1, you really should check this game out.